Click to enlarge photo’s - Scroll down to find Menu’s and Information. 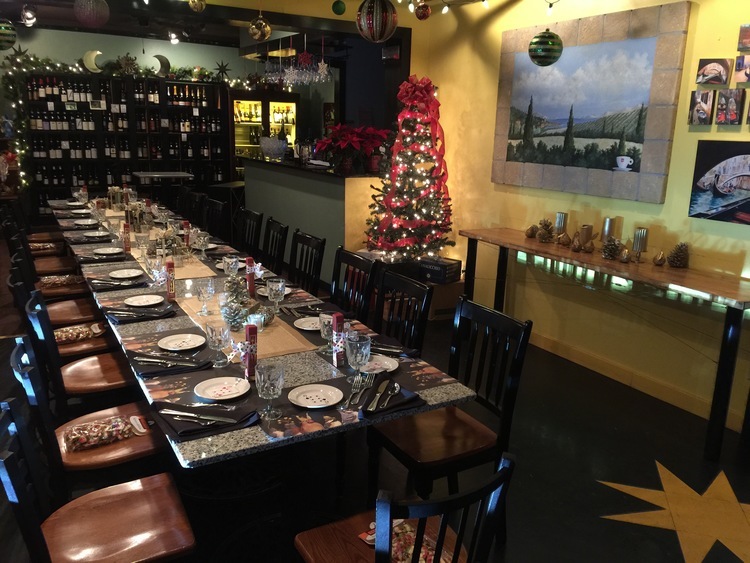 Riccardo’s is proud to host a great space for meetings, parties, etc… The “VinItaly Room” is located across the parking lot from the restaurant in our daytime Cafe/Wine Shop. The room has private entrance, two unisex bathrooms, and limited audio/video capabilities. Food comes from the Chef’s in the restaurant and is transported quickly in hot boxes for the same dining experience and quality as the main dining room with the benefits of a private room. We host seated dinner parties for groups of 10-24 people, and stand-up appetizers and wine for parties up to 35. We only hold one party per evening, which makes the start and end time very flexible (but you will want to book in advance before the day you want is full). Room charge is $200, with a per person menu of $45 which includes appetizers, salad/soup, entree, and dessert. Alcohol and gratuity are separate.